First of all, we appreciate your joining on ROCK OR DIE Monthly with us. And thank you for the jingle also. It is so happy to have you again in this interview. Thanks a lot guys! And we appreciate your support and promo to the band! It’s our pleasure to talk to you again! This is Fragiskos Samoilis answering the questions. I am the new drummer of the band since October of 2010. In 2010, the latest album NO TURNING BACK has been released after an interval of four years. Why you took the time until the release? Well, releasing an album doesn’t always have to do with inspiration only. There are many exogenous factors that affect a release. The years following the releases of “Silent Faces” and “Inner Strength” were quite busy for the band. Live shows, promo stuff and of course the search of a new label, are some reasons for that delay. But I think this interval turned out good for the band. 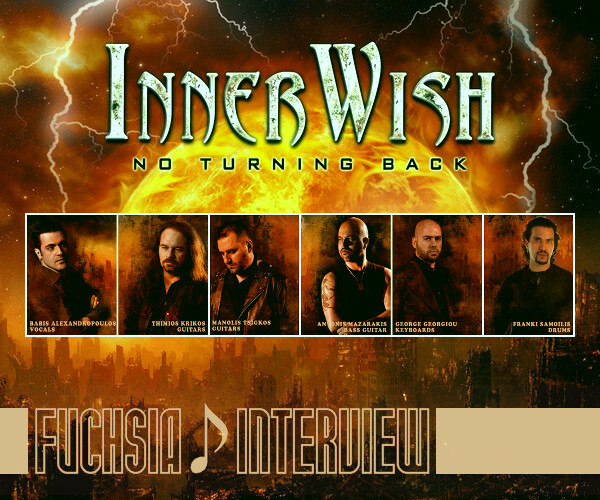 And you can tell that by listening to “No Turning Back”, which in my opinion is the best effort of INNERWISH so far. I believe that our new album will come out sooner than in 4 years time. Actually we begin working on new songs as we speak. Tell us about the back ground that you have moved to the new music label in Sweden. Any particular reasons? Since it was time to find a new label, Ulterium Records made us believe and also proved, that it was the best choice for us. It might be a new label and not a major one, but their work is absolutely professional and we are more than satisfied from our corporation so far. They love INNERWISH, believe in us and try to show it in every way they can. And in my opinion is better you are in a label with fewer bands, and not so many releases, than being in a major label releasing dozens of album every month. In Ulterium INNERWISH are treated as priority and this is a benefit both for the band and the label. I have nothing to say against Ulterium. Only good stuff. You have a keyboard player (sorry I don’t know his name) as a new member in the band. I think the sound you play has been increasing the wide and depth much more. What brought him to your band? 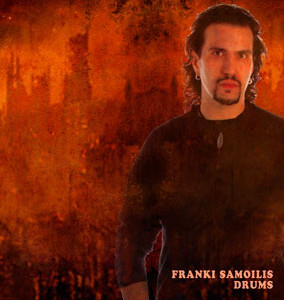 George Georgiou, our keyboard player, is in the band since 2007 and does an excellent job. As you said, the wide and depth in our music has been increased and this also gives us a wider range of composing freedom. I believe that in “No Turning Back” someone can easily understand the difference both in the sound, but also in the musical direction of the band. Keyboards are very useful in this type of metal music and since it works well, there no reason not having them. Riffs and melody are important materials to the band. What is the most concern when you make a song to your band? First of all, when you make a song, you should be the first to like it! If you create music just to please others and don’t please yourself, the result isn’t the best one. Riffs and melody are important materials in general to the genre we belong, if we can say that. All of us like melodies, like riffs (that’s why we love heavy metal after all), and even though we might listen to different types of music and bands as individuals, riffs and melodies are the common elements we all love. Thymios (Krikos) and Manolis (Tsigos), our guitar players, are the main composers of the band and they could answer this question with more details, but the bottom line I believe is what I told you. When you make a song, you should be the first one to like it. You make music first of all for you, and then for the fans. I love your song BURNING DESIRES. What was the reason you picked up that song as a music video? Any episodes we don’t know on the shooting a video? Babis looks good in short hair. Is he going to have long hair again? Hahaha! Well, that’s something you will have to ask Babis about. But I don’t think he is going to have long hair again! Especially if people continue compliment his new short-haired look! :) Seriously, I think the long-haired times of Babis belong to the past. Tell us each members’ favorite artist/band/genre. We hope to see you in Japan soon. Could we have a comment for your Japanese fan? We hope we will be able to come someday in Japan. It’s difficult but not impossible. And personally it’s a dream for me to play in Japan. Japan is a great place for heavy metal bands, especially in the last 10 years, with many and crazy metalheads! You keep the metal spirit in the East alive and we are looking forward meeting you. And to our Japanese fans, I only have to say this… metal on and keep it alive! Thank you for all the support until now and we hope to meet you soon! Take care!